The St. Cloud Rox, 2017 Northwoods League Champions are now accepting applications for Gameday Positions during the 2018 season. 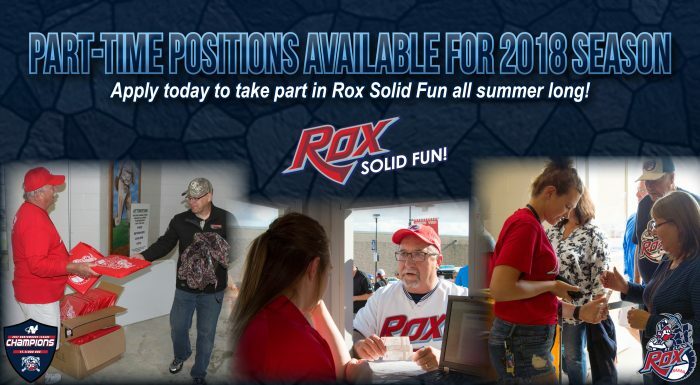 To apply, click on the Rox Employment Application to download an application. Applications can be dropped off at the Rox main office at the west end of the Municipal Athletic Complex, mailed to PO Box 7216, St. Cloud, MN 56302 or emailed to info@stcloudrox.com. The St. Cloud Rox are a member of the finest developmental league for elite college baseball players, the Northwoods League. Entering its 25th anniversary season, the Northwoods League is the largest organized baseball league in the world with 20 teams, drawing significantly more fans, in a friendly ballpark experience, than any league of its kind. A valuable training ground for coaches, umpires and front office staff, 190 former Northwoods League players have advanced to Major League Baseball, including three-time Cy Young Award winner Max Scherzer (WAS), two-time World Series Champions Ben Zobrist (CHC) and Brandon Crawford (SFG) and MLB All-Stars Chris Sale (BOS), Jordan Zimmermann (DET) and Curtis Granderson (TOR). All league games are viewable live via the Northwoods League portal. For more information, visit www.stcloudrox.com or download the new Northwoods League Mobile App on the Apple App Store or on Google Play and set the Rox as your favorite team.